The Strata Mechanics Research Institute of the Polish Academy of Sciences (IMG PAN) has been engaged in extensive research and engineering work focused on applications of anemometric sensors to flow gas measurements, in particular the vane anemometers and hot wire anemometers. The high level of expertise guarantees the state-of-the – art unique solutions in this field. The quality of those solutions and the results of their testing in variable environments prompted the implementation of newly-developed technologies in commercially-available solutions. The IMG PAN Institute is the manufacturer of anemometric devices intended for use in zones threatened by gas explosions, tailored to the specificity of underground mining operations. 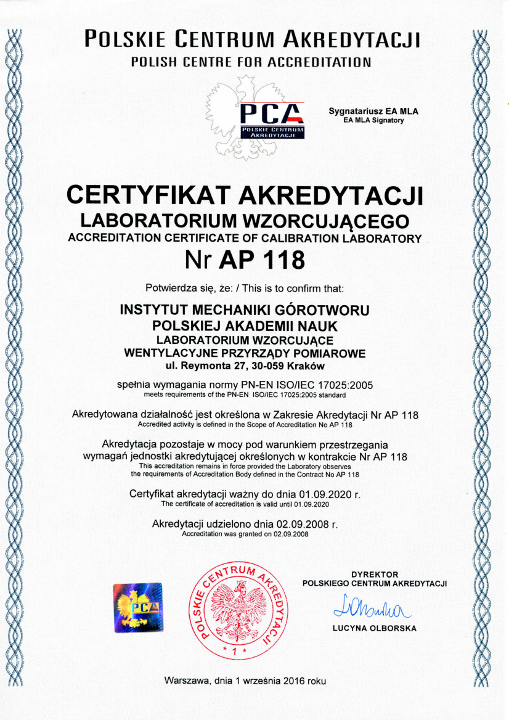 In 2008 The Laboratory of Measurement Systems was set up as a unit of the IMG PAN, which now fully conforms to the quality system rules, in accordance with the standard PN-EN 13980:2002. The major research areas include mining aerology. Vane anemometers are used in the analyses of velocity field distributions in mine workings to obtain the data required for computer simulations of 3D flows in critical points of the ventilation network. Research programs undertaken at the Laboratory make use of thermo-anemometric systems developed in the Laboratory of Flow Metrology of IMG PAN Institute. Apart from research the activities, the Laboratory research team has been engaged in design, fabrication and implementation of devices (safety level category: M1 and M 2), ensuring the highest safety levels, following the guidelines set forth in the Directive 94/9WE, including vane anemometers, new models of anemometric sensors and other sensors and systems for measuring physical parameters of the atmosphere. Anemometric sensors are extensively tested in the wind tunnel at the IMG PAN Institute. Maintaining the highest level of metrological parameters is guaranteed through close collaboration with the IMG PAN Laboratory of Calibration of Measurement Devices for Ventilation, duly accredited in accordance with the standard PN-EN ISO/IEC 17025:2005. Each anemometer is issued a calibration certificate, in accordance with the applicable regulations currently in force in the European Union.